Potomac Disposal's sanitation workers voted on October 29 to accept a three-year agreement between the company and workers' representatives. In it, the company agreed to pay raises, one paid holiday, and sick and vacation days for all the workers. Unfortunately, the parties were not able to agree on affordable health insurance. LiUNA! Vice President and Mid-Atlantic Regional Manager Dennis Martire said, “This agreement is an excellent example of what workers are able to accomplish when they stand together to work for fair compromise with their employer, and we’re so glad that we were able to support these workers during this process.” He added, “However, we're disappointed that the Montgomery County Executive wasn't willing to support a plan to offer the workers affordable health insurance. We expected more given the support shown by the Montgomery County Council. As a result, we will be pursuing a legislative solution to get these workers coverage they can afford." 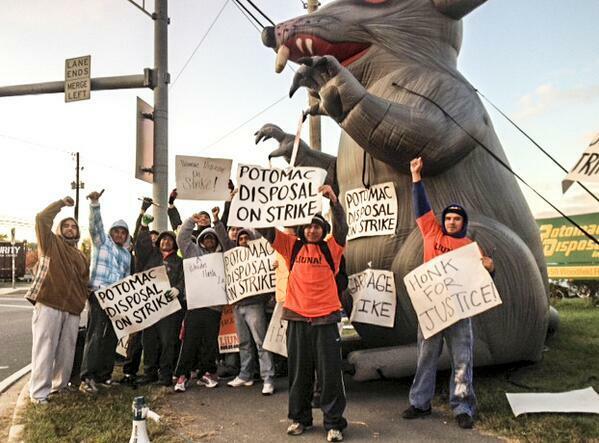 Potomac Disposal did meet several of the workers' top demands, including wage increases, additional sick and vacation days, and a paid holiday. The workers will also be covered by dispute resolution and grievance procedures, which will give the workers resources and procedures to resolve future problems. Potomac Disposal workers will return to work on Wednesday October 30. Unity Disposal and Recycling Workers will also return to work Wednesday. “The Unity workers feel they have made the statement they wanted to make, and it’s time now to move the conversation forward by returning to work to show their commitment to the community while continuing to work from within the company for union recognition,” said Martire.